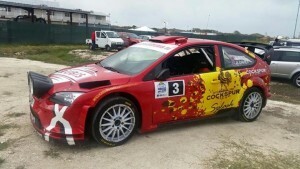 SOL Rally Barbados is one of the biggest sporting events to be held in the Carribean. Thousands of spectators flock to see some of the best drivers from the surrounding islands and also some of the best International drivers around. The event spans over 2 weeks with the King of the Hill sprint kicking things of a week before the main event which runs from Friday night until Sunday. This year there was an exceptional entry for the event with around 40 crews travelling from the UK. At the front there were all the Rally Barbados regulars, Roger Skeete, Rob Swann, Roger Hill, Roger Duckworth and then came a trio of Ford Focus WRC’s all supported by Dom Buckley Motorsport. Paul Bird would once again have Aled Davies on the notes, Jeff Panton in the Rubis fuel backed Focus would have Mike Fennel sat next to him whilst Simon Jean-Joseph, the ex WRC driver would be piloting John Powell’s Ford Focus as John had work commitments for the weekend of the King of the Hill. As of that wasn’t enough, another former WRC star, Toni Gardemeister would drive the Simpsons Motors Suzuki WRC on the main event. The fans of the rally were in for a real treat this year. King of the Hill event is a 1 short stage. The crews get one practice run and 3 timed runs. The fastest time of the three will be used as their driver. The finishing order for this event will determine where you will run on the main event the following week. On the practice run Bird was fastest and felt comfortable but that didn’t count for anything. This was proven about 500 meters into his first timed run where he overcooked it slightly on a right hander and spun off the road and ended up with the car parked over a 20ft deep well. Not a great start. The rest were through cleanly. Panton picked up a puncture on the 2nd run and Jean-Joseph was stil getting used to the car as he hadn’t driven on tarmac for a few year. It would come down to the final run and it was the local man Roger Skeete who would take victory and the number 1 plate for his door for the following week. Panton got it together for the 3rd run through and was 2nd quickest followed by Bird, followed by Jean Joseph. less than 1 second split the top 3 so we knew we were going to be in for a cracker the next week. unless your rivals also have some sort of trouble. The opening stages were as close as the week previous, after stage 6 Panton led Bird and Jean-Joseph but they were all separated by only 1.6 seconds. This pace continued throughout the day and by the end of day one Panton was still leading the other 2 Focus WRC’s. Bird +1.5 and Jean Joseph had a small problem on one stage and dropped 8.2 seconds behind Panton overall. We were also involved in supporting some of the other locals on the event and at the end of day 1 they occupied the top 3 of Gp N. Andrew Mallalieu was 1st in Gp N (13th OA), John Powell 2nd Gp N (16th OA) and David Coehlo 3rd Gp N (18th OA) and also in 21st OA was Avinash Chatrani. So it was official, the battle was going to go all the way to the end. Panton would be pushed every inch of the way and the other 2 would be there to pounce if he made a mistake. The three drivers traded times on every stage, Bird would take a small amount of time from them on one stage then Jean-Joseph and then Panton would rule them both out on the next one and we were back to where we started. 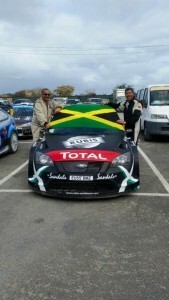 with 4 stages left on the event Jean Joseph was still 3rd but had closed the gap to 5.9 seconds. Bird was still 2nd right on the back bumper of Panton, only 1.4 ahead now. Someone was going to have to step it up if they wanted to catch Panton who seemed in control. Bird pushed, but he pushed too hard, on the second last stage he spun and stalled dropping 8 seconds. dropping him behind Jean Joseph to 3rd. That would be that until the end of the rally. Panton would take the victory, a very well deserved victory and Jean-Joseph done just enough to stay ahead of Bird to claim 2nd. Powell caught Mallaleu and claimed Gp N victory with Coehlo holding onto 3rd and Chatrani climbed to 19th OA and claimed 3rd in Gp A. A very successful event from our point of view and also from the organisers point of view.